About the Stage A Course. Minimum course duration – 16 hours. Safety for freediving. Rules of behavior for freediving. avoiding and reacting to blackout and “surface samba” (loss of motor control). 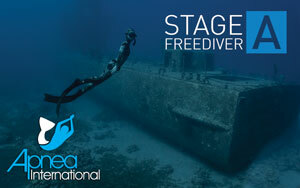 The Training sessions include Static breathhold training, Dynamic training and open water sessions. The emphasis is on energy efficient movement in the water. The main idea is to prolong the dive time and not only the depth. It is important to understand that with proper training and knowledge a Freediver will improve the depth as well as the dive time. Always maintain a long enough recovery between dives. Move slowly! Quick movements use more O2 and are usually less efficient. Maintain Streamlining. Equalise on descent, never on ascent. Never dive sick or if equalisation is not possible.